Reducing waste and helping with everyday tasks, our Tape Dispenser Dual Core will quickly become a staple in your office environment. The durable outer casing and weighted base hold it securely during use, with the help of an additional non-slip rubber base. The entire dispenser has been finished in a versatile black design to blend in with the rest of your resources. Simply load up with standard rolls of sellotape and use the raised blade to slice off at your desired length. 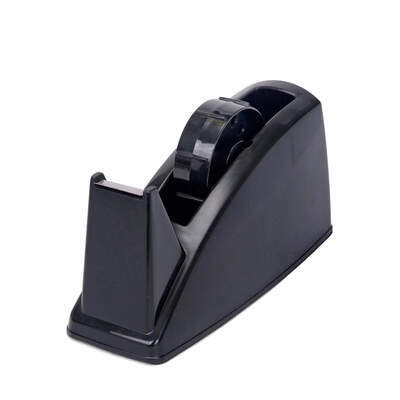 This tape dispenser is easy to reload with a removable inner core and is sure to become regularly used for everyday organisation and business needs. Our wide range of Office Supplies is packed with everything you'll need to create an organised and professional environment. From our Reception Pen through to our Heavy Duty Laminator, our products are designed to offer exceptional value within your budget.